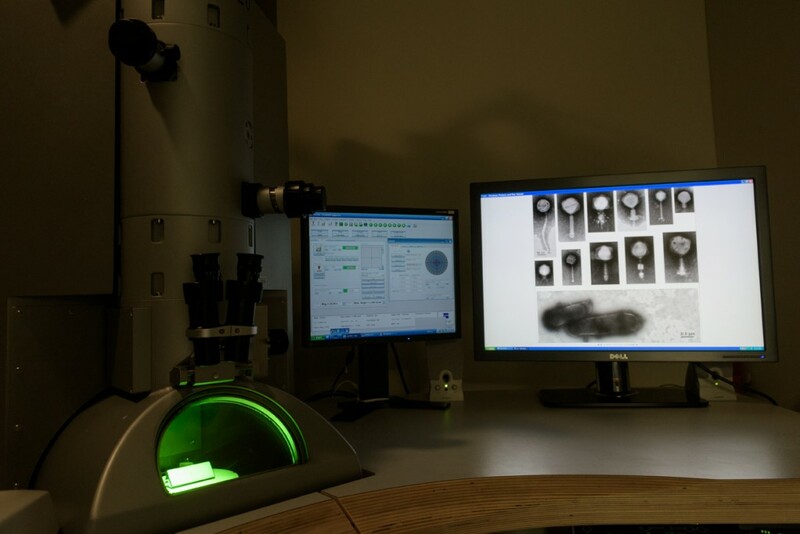 The Apreo VolumeScope™ scanning electron microscope (SEM) is a high resolution system which offers imaging at both high and low vacuum, as well as, acquiring large area montages using its MAPS software. The system can be rapidly switched from conventional SEM to Serial-Block Face (SBF) imaging. As an SBF imaging system, the VolumeScope™ uses a novel technique that combines both mechanical and optical sectioning using Thermo Scientific’s proprietary Multi-Energy Deconvolution technology. This facilitates automated acquisition of large sample volumes at isotropic resolution. SBF allows researchers to view complex 3D architecture of cells and tissues in its natural context. The system also has a Quorum PP3010T Cryo-SEM system for imaging frozen hydrated specimens.The system is highly automated and offers a platinum target. 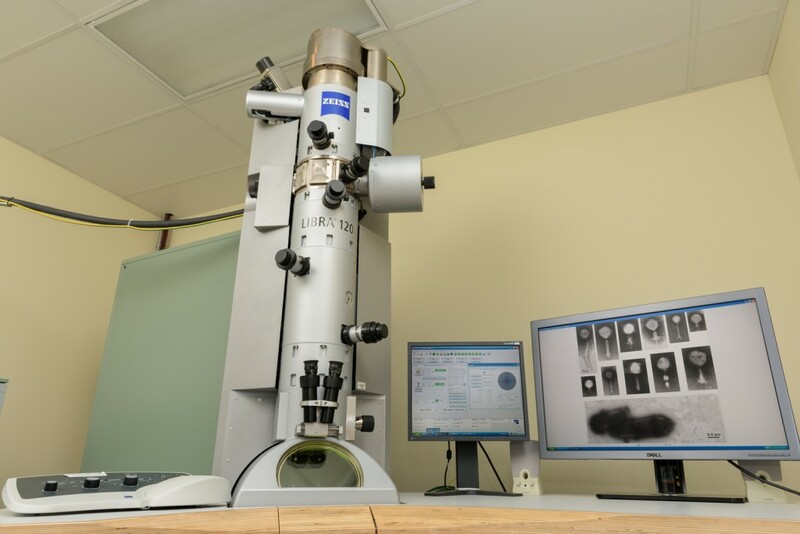 The Zeiss LIBRA 120 transmission electron microscope (TEM) is an energy filtering TEM with a Gatan Ultrascan 1000 2k x 2k CCD camera. The energy filter and slit aperture provide high contrast of stained and unstained specimens and permit elemental analysis (EELS/ESI), particularly of light elements. Furthermore, the system is capable of electron tomography to create high resolution 3D reconstructions of submicron volumes. The Libra 120 is equipped with a Gatan cryo-holder, cryo-transfer station, and dry pumping station for cryo-TEM of aqueous suspensions. 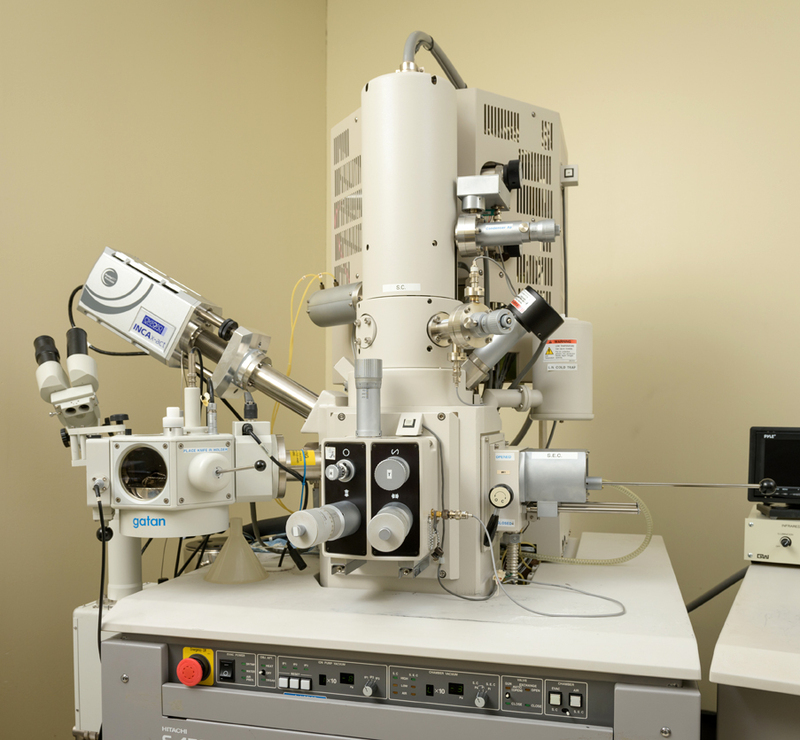 The Hitachi S4700 Scanning Electron Microscope is a field-emission SEM. The system is equipped with a Gatan Alto 2500 cryo-system for imaging frozen hydrated samples. Elemental analysis through EDS is also possible using an Oxford Inca X-act detector.